If you are looking for a really special belt for that really special outfit then this may work. This belt comes in gold or silver color and is 70cm long and 1cm wide and the buckle are two leaves that connect together to close the belt. And the gold or silver from the belt and buckle of course because an unique accent to your already amazing looking outfit. Get your Gold Belt With Leaves for $4.90 and Free Shipping. Sure you can get a boring plain colored belt and it probably works perfect. But if you want a bit more color then you have to look at this belt. 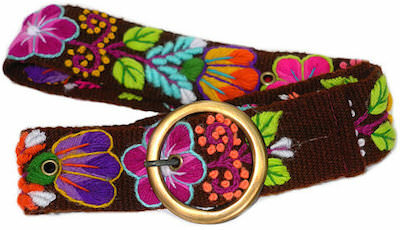 This belt is handmade in Peru and is made from 100% wool. The belt is brown but has all kind of bright colored leaves and flowers on them making this a perfect belt to bring some life to you outfit. And this flower belt comes in a wide range of sizes so that you can get one that fits you perfectly. Dress, shirt or jeans all can get some extra color when worn with this belt. This belt will sparkle and that makes it so perfect for you. 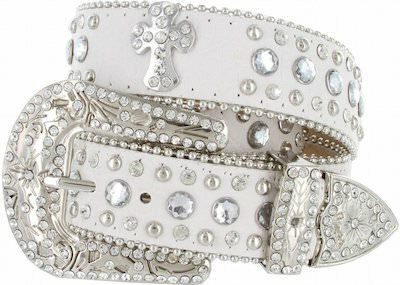 A belt that comes in white or black and has a fun buckle with rhinestone inlay and even the belt has lots of shiny rhinestones on it and even a silver cross with rhinestone inlayed. A belt like this is perfect for a country outfit but work with a nice pair of jeans to. And this women’s belt is available in many sizes covering 31 – 41 inch. Get your White Rhinestone Western Style Women’s Belt for $19.00 and Free Shipping. Belts are great to bring some fun and color in to clothes. Change the belt and you have a complete new outfit. This pink belt is one of those super cute belts that will work with so many outfits. The belt is pink and has a bow tie buckle to add a fun accents to your outfit. 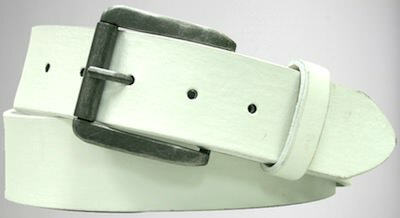 Click on the picture of the belt for more photo’s and to see how it would look on you. Get your Pink Bow Tie Belt for $4.44 and Free Shipping. A nice and thing belt with a leopard print design on it and two golden hearts as the belt buckle that closes it all. The animal print makes it great to wear this faux leather belt with almost anything. You can adjust the size of this leopard print belt between 53 and 94 cm and it is about 1.2 cm high. Get your Leopard Print Belt for $23.99 and Free Shipping.